Funchal dates back to over 500 years, owes its name to a the wild herb, the “Foeniculum Vulgare” traditionally known as fennel or funcho, which existed in abundance at the time of its settlement. Given Funchal´s coastal position permitted Funchal to develop and urban and surpass the populations of other settlements around it and became an important maritime port for commercial interests . During the second half of the 15th century, the sugar industry expanded significantly which contributed to the consolidation of the island and the city of Funchal as one of the most important centres of civil activity in Imperial Portugal during the sixteenth through to the eighteenth centuries. Quinta Mar & Sol: Bed & Breakfast located about 2 Km from the beautiful centre of Funchal, so this is an ideal location to spend your holiday in Madeira. 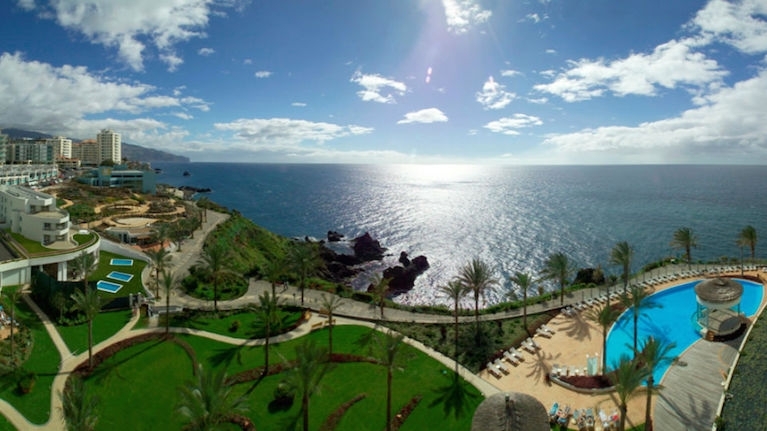 Vitorina Corte Guesthouse: This Madeira guest house is just 1 km from a beach area. 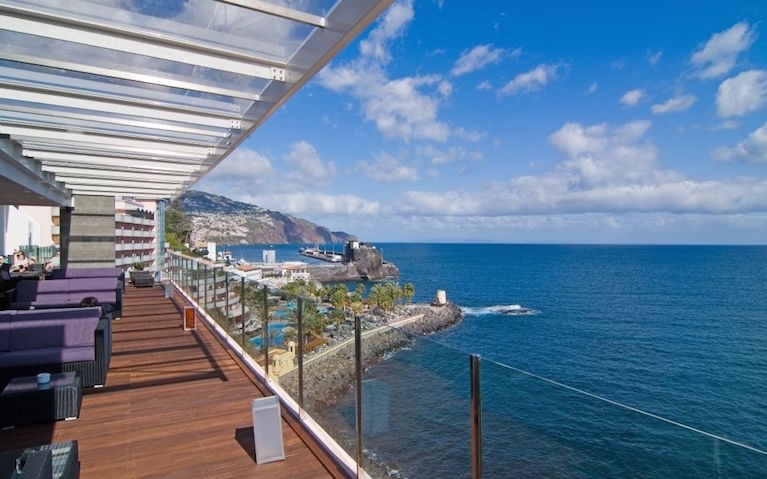 Vidamar Resorts Madeira: The 5-star Vidamar Resorts Madeira is situated on Madeira’s southern coast, just few minutes’ walk from central Funchal. The Cliff Bay (Porto Bay): Situated atop a natural peninsula, The Cliff Bay provides panoramic Atlantic Ocean views and private sea access. Discover Funchal in an open-top double-decker bus that allows you to hop-on and hop-off at 16 different stops whenever you wish, all day long. Experience the best of Funchal aboard this hop-on hop-off sightseeing tour. You'll see all the beautiful sights of the city in a comfortable and secure environment, with full commentary provided. Tickets are valid for 24 hours. Book NOW online and aovid the queues. Situated in a bay bathed by the Atlantic Ocean, Funchal is located in the south between Santa Cruz and Camara de Lobos and is the largest tourist and commercial center of Madeira. Funchal offers a wide variety of holidays activities, from visits to parks, museums and other beautiful landmarks, to levada walks, boat trips and going out at night to bars and nightclubs. The city of Funchal it is possbible to visit churches, chapels, and manor houses call back to the city’s origins and Funchal’s museums display plenty of artistic monuments, which reflects its past periods, especially Museu de Arte Sacra. • Imaculado Coração de Maria - a northern suburb, it is one of the smaller parishes in area, with the highest concentrations of residents. • Monte - originally a summer refuge for the wealthy, due to its mild climate, Monte is symbolized by the toboggan drivers that race tourists down to the central town. • Santa Luzia - one of the four urban suburbs of Funchal, this parish was created in 1676 and now is home to the Santa Luzia Park. • São Pedro - central to the business and residential character of Funchal, as well as several museums. • São Roque - deannexed from Sé under the authority of Cardinal Infante Henriques, the prelate of Funchal constructed this parish from sections of São Pedro and São Martinho. • Sé - the historical centre of Funchal, and most developed, including many of the older buildings. 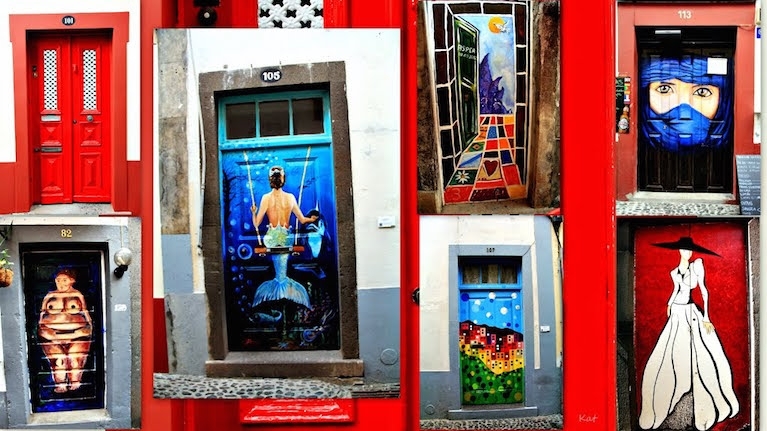 Visit the old town where you will be able to appreciate the art and culture that Funchal has to offer. The project began in 2010 with the aim to bring back to life the old town. The streets have now turned into a cultural space, testament of the creativity of local artists, turning the doors of houses, shops, bars and restaurants into works of art. Visit the local Marina and enjoy a pleasant stroll along the seafront, where you will find several coffee shops and restaurants. The harbor of Funchal nowadays attracts some of the largest cruise ships in the world. Why not enjoy a boat trip where you can spot whales, turtles and dolphins. With a total area of 36.000 square meters the Parque de Santa Catarina offers a spectacular views of the port of Funchal. The park , located between Avenida do Infante and Avenida Sá Carneiro, is surrounded by tree species from all over the world. Visitors can find the Santa Catarina Chapel and a lake, home to different bird species.